Now in its 13th volume, the Walt's People series is the pinnacle of accessible but authoritative Disney scholarship. The series was launched in 2005 by Disney historian and author Didier Ghez to present the vast treasure trove of hard-to-find interviews with Disney artists, animators, executives, and Imagineers who either worked with Walt Disney directly or had significant influence in the development of the Disney Studios and the Disney theme parks. 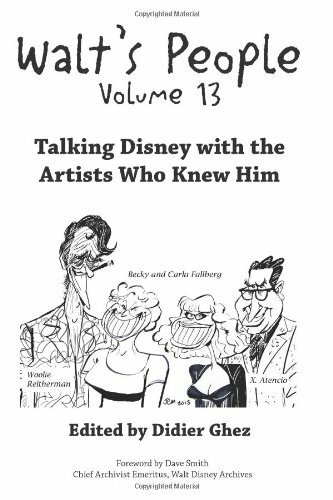 Volume 13, the first published by Theme Park Press with an improved layout and stringent editing, features such Disney legends as Roy E. Disney, Blaine Gibson, X Atencio, Fess Parker, Don Iwerks, Bob Moore, Tony Baxter, Floyd Gottfredson, and over twenty other Disney notables who reminisce about careers spanning from the 1920s through the present. The interviews are conducted by a who's who of Disney authorities, including Didier Ghez, Jim Korkis, Michael Barrier, John Canemaker, Les Perkins, Michael Broggie, John Culhane, Dave Smith, and Paul F. Anderson. Pixar's Pete Docter, the Oscar-winning director of Up and Monsters, Inc., examines the forgotten career of John Sibley, Disney's "Tenth Old Man", whose animations still dazzle today. Fess Parker relates how a bit part in the classic 1950s giant ant monster movie Them! netted him the role of Disney's Davy Crockett. Don Iwerks, son of Walt's first partner Ub Iwerks, chats with Michael Broggie, son of Walt's first Imagineer, Roger Broggie, about their respective careers following in the footsteps of their fathers. Virginia Davis recalls her role as "Alice" in Walt Disney's Alice Comedies, a series of short films from the early 1920s that predated Mickey Mouse and were equally as important as Mickey in putting Walt on his path to success. British actor Richard Todd (well-known for his portrayal of Robin Hood) remembers how the seeds of Disneyland may have taken root the day he and Walt went to Coney Island to eat cotton candy and ride the wooden roller coasters. And much, much more. Take your Disney knowledge to the next level with Volume 13 of Walt's People.